We're finally getting cooler temps and though I don't know how long they will last, I'm planning on squeezing every available moment out of it. Fall to me is all about pumpkins, and changing leaves, cooler temps, cinnamon, stews, soups and apple butter. Yum! 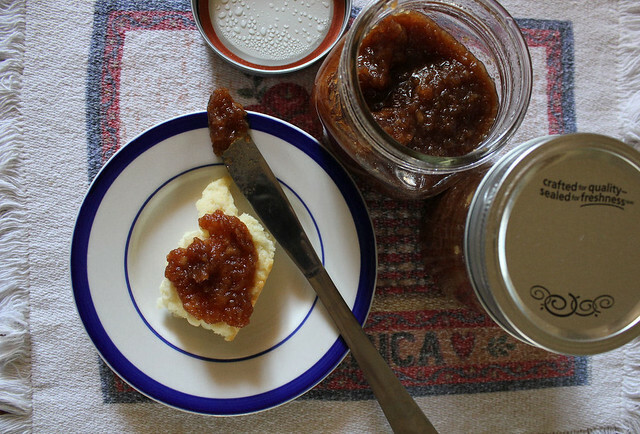 Honestly, I could buy apple butter and sometimes I still do when I go to the farm to pick pumpkins, but it's SO easy to make at home and tastier too, in my opinion. Now I know there are a gazillion and one recipes out there floating around for homemade apple butter, on the stove, in the oven, in the crockpot etc. Some take two days, others take 10 days, but I don't have the patience to wait that long because once my house starts smelling like baked apples and cinnamon it takes everything out of me not to shove my face in that pot. 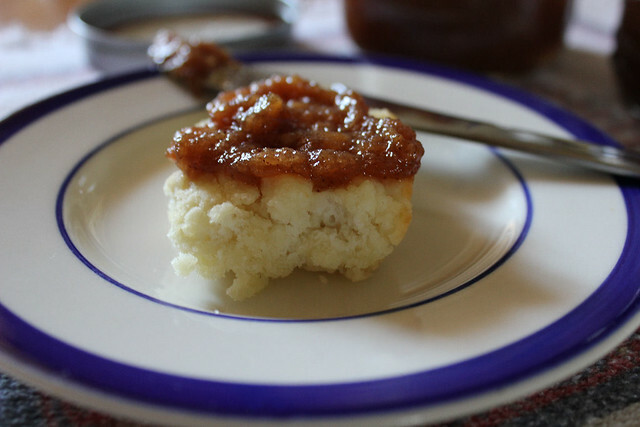 I've been making this apple butter for years and I don't really have a recipe for it, per say, it's just what I've come up with in my attempt to use both a slow cooker and not have to wait days to taste the result. Fill the crockpot with the apples, add the sugar and sprinkle on cinnamon and nutmeg to taste. Add the vanilla extract, I add about a tablespoon depending on how much I'm making, again just eyeball it and add to taste. Cover the crockpot and cook on LOW for 8 hours. When it's done cooking, take a potato masher and start mashing the apples. Some people like it chunky, others like it really smooth, if that's how you prefer then just give it a good blitz with an immersion blender. I find that for us, I just mash it with the masher, then mash it again, then again etc until I get it smooth but still has a few little pieces floating around. I don't need to can these because I didn't make too much, just enough for two small jars and they will be gone FAST. If you're making a big batch, just remember to can the butter accordingly. Yummy!! I know what I'm making today! I have OAS (oral allergy syndrome) and can't eat any raw fruits, so I'm thrilled when you post fruit recipes like this! Thank-you! Do I need to refrigerate this? If I don't have mason jars will rubbermaid container work?? This sounds and looks delicious. I wonder if it would freeze well. I made this two weeks ago. It took 36 hours in my crockpot to get thick enough. I canned 8 jars. It so yummy I should have made 16! I wonder if it would freeze well. Have you ever tried it ? OK...finally getting a chance to make this.. hopefully this weekend. I was wondering, since we don't eat it that much, how many apples for... say... a pint jar? I don't want to can them because I just don't have enough jars and um... I haven't canned in years!! Made some homemade bread today and this would go so great with it! Thanks!! Thanks again woman! you know... you ought to look into writing your own cookbook! Hope you have a blessed day tomorrow. Thanks Sandra! You're the best! !